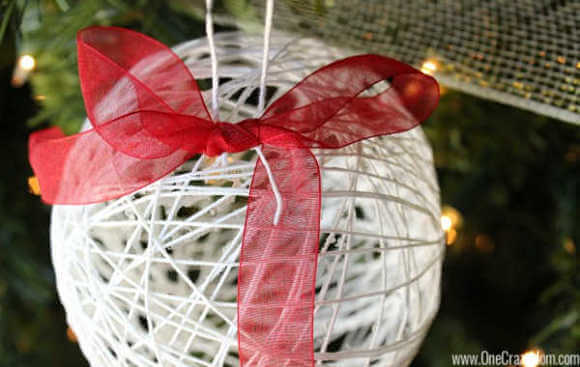 Learn how to make a string ornament that is simple but gorgeous with this easy tutorial. It is so easy to make DIY Christmas Ornaments and budget friendly when all the supplies are from the Dollar Store! Have you seen those gorgeous string ornaments but didn’t want to pay the hefty price? Well, we have a really sweet ornament for you to try today – it is a Dollar Store String Ornament. 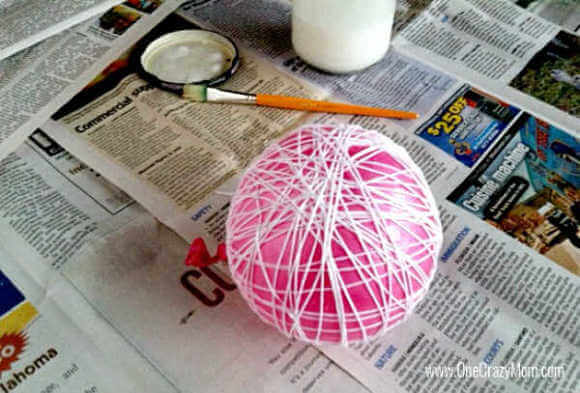 You can learn how to make how to make string balls with balloons that cost very little to make. This is perfect for our 12 days of Homemade Christmas ornaments. I have been wanting to make some string balls for a while now and finally decided to try it, but in ornament form. I just love the look of this ornament and I think you are going to be excited with how easy this is! Keep reading to find out how you can make your own Homemade Christmas Ornaments! Get the kids involved because this is really a neat project to do. They will love all the fun steps and you all will have a blast making these together! Dollar Store Ornaments are budget friendly and pretty too! It is also great if you need more ornaments but don’t want to spend a ton of money purchasing them. If you’re children have Christmas trees in their rooms, this is a great way to help them get started with ornaments. 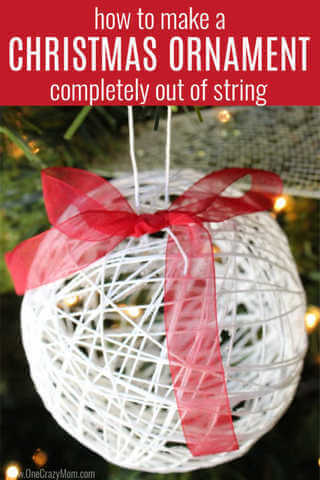 All of the supplies needed come from the dollar store so it is very inexpensive to make lots of these string ornaments. It can really add up decorating a tree and especially if you have more than one. This is a budget friendly way to have lots of ornaments without spending much money. 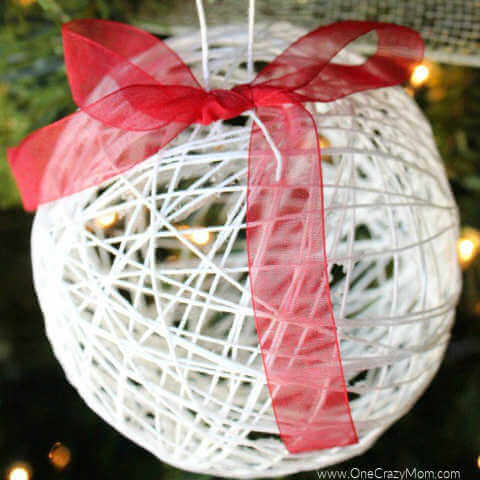 You can also just make these as string balls and display them in a glass bowl. Lots of great idea with these! We love making DIY Christmas Ornaments for kids every year! Make homemade mod podge for DIY Christmas Ornaments. It is very simple to learn how to make homemade mod podge. If you do a lot of crafting like we do, this will really help the budget. You will love how easy it is to make and how frugal it is to make with school glue and water. It is just white glue really! Blow up your balloon to the size you would like your dollar store string ornament. ( I do similar to a small water balloon size.) Tie off the balloon. Slather Mod Podge all over the balloon. Quickly wrap string around the balloon in a vertical direction until about 75% of the balloon is covered. Now, wrap the string around the balloon in a horizontal direction until about 75% of the balloon is covered and cut the string. Go over all of the string with Mod Podge again but wipe off excess glue. Be sure you get all of the string or you can dip the string if you prefer. Hang to dry overnight or about 8 hours. I used a clothespin to clip the end of the balloon to a hanger. This made a great way to dry the string ball evenly. 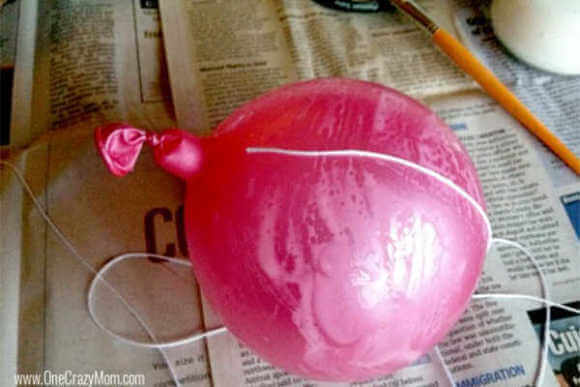 Once the strings are hardened and completely dry, pop the balloon and watch as the sides peel away from the balloon. Carefully remove the balloon from the ball. I simply kept a hold of the top of the balloon and slowly pulled it out of the string ball. Add a loop of string for your ornament hanger and hot glue on a ribbon bow. It is that simple to make DIY Christmas Ornaments! You will not believe how easy it is until you give it a try! The kids will have a blast. 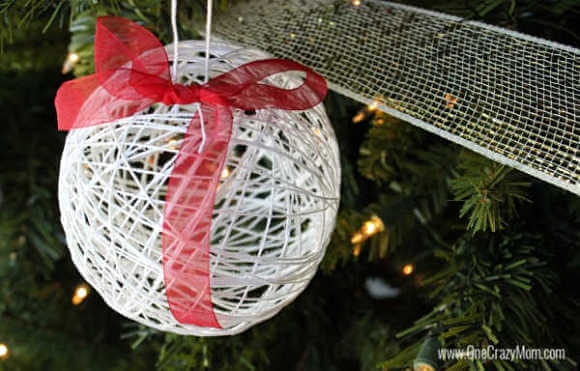 This dollar store string ornament is so simple, yet so pretty. Once you make the ornaments, you can even learn how to make a string ball chandelier. That is such a fun idea for a child’s room. String balloon lanterns would also be fun to make for parties! You can make these any size you’d like. Try adding glitter if you want an extra pop. Just sprinkle some glitter on it (do this when the Mod Podge is still wet). My kids just thought this was the coolest ornament ever! Experiment with more string ornaments starch ideas and shapes. Use ornament hanging string or ribbon for ornaments. Now that you know how to make a string ornament it is so easy and fun to do! Gather the kids and get started. I can’t wait to hear how much fun you had. We always make an afternoon of it and it is a great family activity. Everyone has a blast and gets to make some pretty amazing ornaments while making even sweeter memories! Kids of all ages can help make these ornaments. 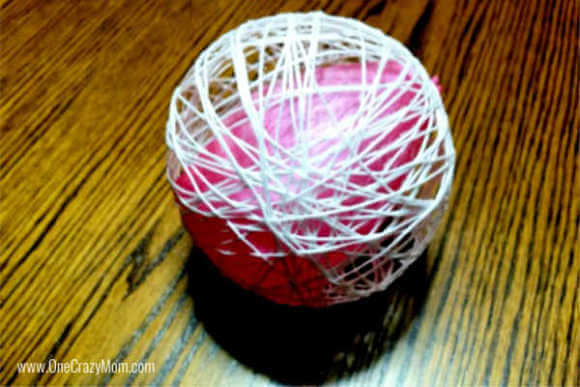 Once you learn how to make a Christmas ornament completely out of string, you will be hooked! Come back and leave a comment letting us know how they turned out! If you are looking for some clever (and easy) ornaments that you can make on your own, we’ve rounded up over 30 Easy Homemade Christmas Ornaments. 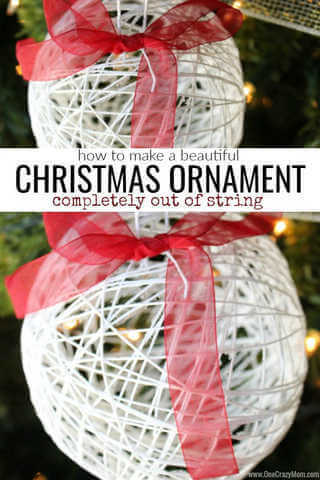 If you like this Dollar Store string ornament, make sure you follow our 12 Days of Homemade Christmas Ornaments series.